Did you know that you have the capability to limit connections to your FileMaker 12 file? Say that you have developed a solution for one workgroup, another workgroup uses the solution but you have concerns the second workgroup might try to blend one of their FileMaker files to yours. 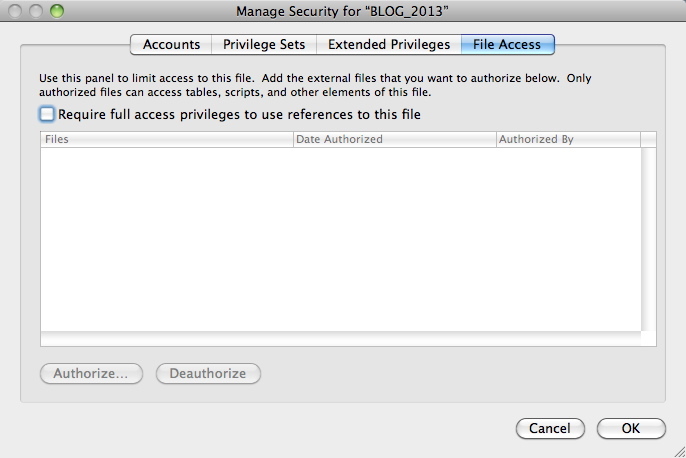 There is a tab in the Manage Security dialog box called "File Access" which has a check box "ON" control and then a mechanism to load authorized access to specific external files. each authorized file is assigned a unique identifier, which the protected file keeps track of, ensuring that the protected file remains protected even if it is renamed or duplicated. Any efforts to bypass authorization, such as by replacing an authorized file with a different one, will be unsuccessful.